Are Amazon’s Private Label Brands a Trend for Other Merchants? Amazon has made significant investments in its own private label brands, such as diapers, dog food, and paper towels. The company’s private label strategy may be indicative of a burgeoning retail movement. Private labels may be something that mid-market retail businesses could try. As of June 2018, Amazon sells more than 70 of its own private label brands on its marketplace, according to reports from Gartner L2 and One Click Retail. Barron’s reported that Amazon private label sales could reach $25 billion annually by 2022. 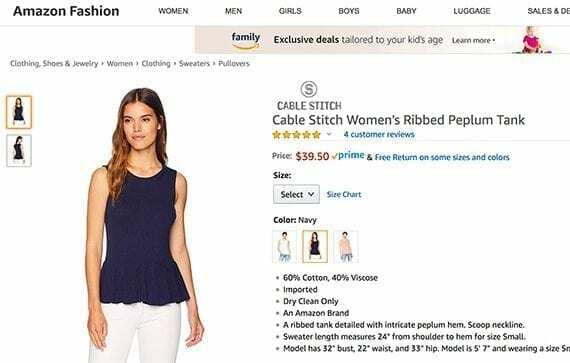 Cable Stitch is one of Amazon’s many private label brands. While Amazon has not publicly stated what its private label brand strategy is or why it seems to be investing now, there are trends that could be driving some retailers — perhaps including Amazon — toward private label products. These trends include a possible erosion in national brand loyalty, changes in consumer shopping behavior, and competitive price pressure. Creating a private label brand can be a long and expensive process. But private labels may help pure play ecommerce companies and brick-and-click stores drive incremental sales, secure customer relationships, and earn a bit more margin. According to Pasquarelli, millennials — who are folks born from the early 1980s through early 2000s — may not be loyal to long-established national brands. While it is important not to make broad statements about all millennials, an October 2017 Fast Company article reported significant differences in brand preferences between baby boomers and millennials. READ ALSO Do Amazon’s New 'Dynamic Bid' Ads Improve Sales? Even small changes in brand loyalty could give new brands, including private label brands from Amazon and other merchants, an opportunity to earn market share. Thus, if brand erosion is real, it might be a time to try to switch some shoppers from a national label to a company’s own products. A second retail trend that may represent a private label opportunity is the way ecommerce and ecommerce subscription services are changing shopping behavior. Consider the case of Dollar Shave Club. The company, which was founded in January 2011, sold to Unilever for $1 billion in 2016. Dollar Shave Club offered good quality shaving products at prices below what national brands charge. It delivered those products on a subscription basis. Dollar Shave Club forced market leaders like Gillette to offer their own subscription service and begin a marketing campaign to help maintain market share. Shopping online can be a lot more convenient than visiting a physical store. And, in turn, a subscription service can be a lot more convenient than having to log in to an ecommerce site every month to purchase a consumable. This is a private label opportunity because, as Dollar Shave Club demonstrated, convenience and price may trump previous brand and store associations. For some retail product categories, price competition has shrunk margins for popular national brands. When a customer can buy an identical product on Amazon or Jet.com for less, other retailers can have difficulty competing. Private label brands relieve price pressure in at least two ways. First, the product is not available in other stores. Second, it typically comes to the retailer at a lower cost, so it can sell at or below the national brand price and still earn a better margin. Taken together, price competition for established brands, changes in consumer buying patterns, and the erosion of some brands represent an opportunity for businesses for just about any broad-line, mid-market retail operation to benefit from a private label strategy. Store loyalty. Private label brands can build a loyal following. In fact, some ecommerce businesses only sell their own brands. Beardbrand, for example, has built a strong community for its products. Retailers selling an array of private label items may find that they can generate loyal, repeat customers. Price-point gap. Some retailers may be able to fit private label alternatives into price-point gaps. It may be that a market has a premium brand that represents the best and most expensive product available. There may also be a low-cost alternative, leaving a price-point gap in the middle for a good quality private label that costs less than the premium brand but is better than the low-cost product. Better margins. Again, private label brands can have better margins than some of their more-recognizable national brands. In general, margins are better because the retailer selects and manufactures the product, typically via a contractor. Will Amazon’s Brand Registry restrict marketplace sellers?